The Tell is located on the ancient Via Maris road, south to Afek. It was inhabited from the Bronze period through the Byzantine period. (Isaiah 9,1): “...the way of the sea... in Galilee of the nations”. 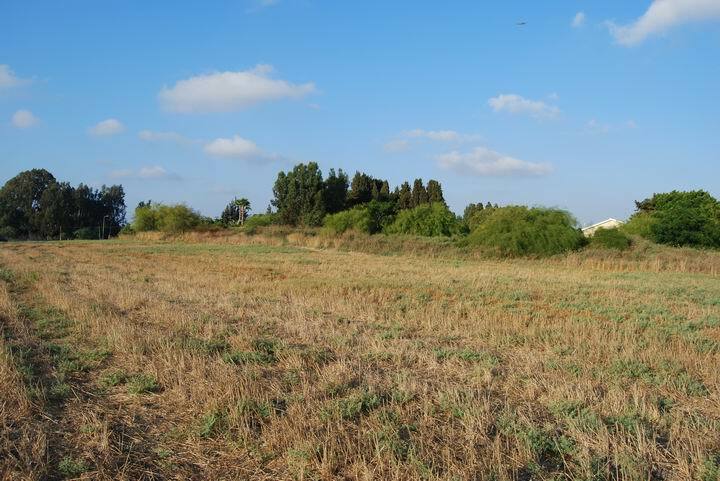 The site is located on the coastal section of the ancient road of Via Maris (Derech Hayam), the major highway that connected for centuries the south and the north of Israel. Tell Zavat was one of the sites along this ancient road. According to archaeological survey, the majority of the findings are from the Israelite period through the Byzantine period. Today the site is in ruins and was badly damaged by residential houses on its eastern side, farming on the south and west side, and a busy road on its north side. A new highway is planned to be built on its eastern side, and recently (2007) emergency excavations may have found a section of the ancient road. 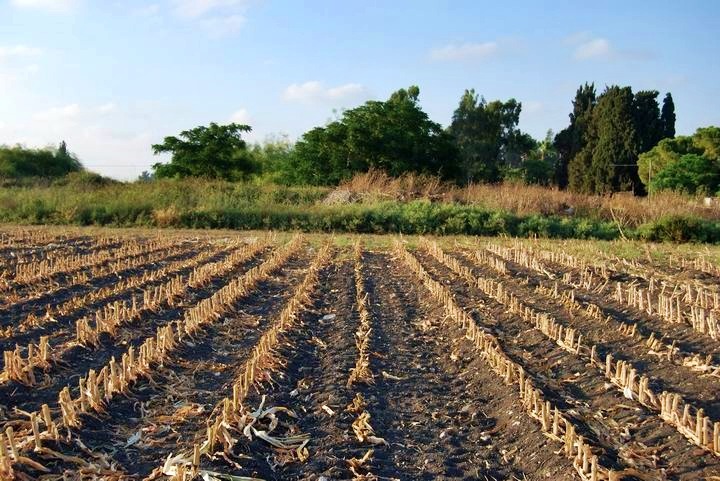 The site is located in the plains south to Afek, south of Acre (Akko), on the south side of the modern agriculture village of Kefar Bialik. It is easily accessed from Kalaniot street. The tell is 6M higher than the fields around it, and its size is roughly 100m x 150M. Most of the antiquities are buried under the fields around the Tell at depths of up to 3M, so the actual size of the Tell in its peak size during the Hellenistic period was much larger. Via Maris ("Derech Hayam" - the way of the sea) was the major highway that for centuries connected the center and south of the Holy Land (Egypt and Africa) - to its north and beyond (Syria, Mesopotamia and Asia Minor). 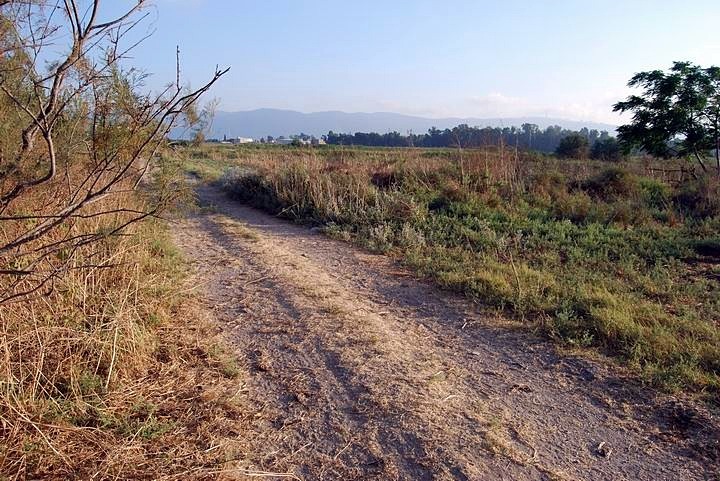 This trade road was the spine of the fertile crescent. The road had two Galilee branches - the western (coastal) branch which passes at Tell Zavat, and the eastern branch that passes through the Sea of Galilee. a south-eastern road - towards Yokneam, then around Mount Carmel on its eastern side. It also continued on to Megiddo and connected to the eastern section. Both roads then converged after passing mount Carmel, about 30KM south, and continued along the coast through the heart of Israel towards Egypt. The following aerial view shows the estimated location of these roads that split somewhere near Tell Zavat. This probably was at Khirbet Gedora, a few hundred meters north. The choice of Gedora as a splitting point is based on the topography and is enforced by the fact that its name, "Gedro", is written as a landmark in a Roman milestone in Nahariyah. 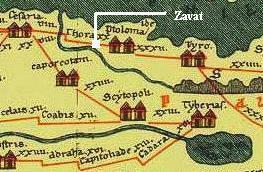 Tell Zavat was one of the sites along the south-western road. In the aerial view above you can see how dense were the sites along the ancient road: there was a site almost every Kilometer, and the location of the sites was selected due to their proximity to the road, the natural higher ground (a hill) and close to source of water (wells). The Romans perfected the art of road building, and enabled them to effectively manage the vast empire by improving the links between the cities, especially for military purposes. The Peutinger map (Peutingeriana tabula) of the 4th C Imperial Roman roads shows the coastal way from Acre ("Ptolemaide" in the top center) through Dor ("Thora") to Caesarea Maritama ("Cesaria" on the top left). 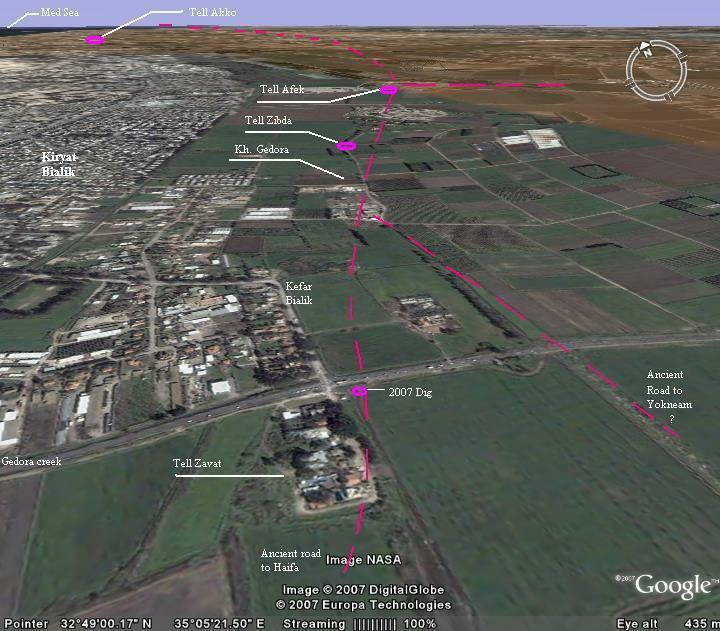 The position of Zavat is shown on the map, close to the Kishon river. Archaeological surveys (1952, 1958) dated the earlier periods in the site to the middle bronze period II (2000-1550 BC) and possibly even the earlier Bronze period (3150-2000 BC). The site continued through the Late Canaanite period (1550 BC - 1200 BC), the Israelite and Persian period (1200-332 BC). It peaked at the Hellenistic period (332BC - 37 C BC), probably as a Phoenician site under the Seleucid Kingdom ruled from Tyre. The site continued as a smaller village through the Roman and Byzantine periods (1st C BC thru 6th C AD). The site was ruined in the Arab period (7th C) and stayed in ruins since then. According to recent excavations, the shore was much closer to the site in antiquity than it is today. Over the years sand accumulated in the bay of Haifa, receding the shoreline. The area around the Tell became swamps, since the water from the east were not drained to the sea and filled up the area. In the area north of the Tell the Bedouin peasants lived in tents and huts on the income from the swamps. In the PEF map of 1880 their villages are called "Tell el Chiar" (near Kalaniot street, 100M NE) and "Jidro" (on the ruins of Hurbat Gedora, 300NE). 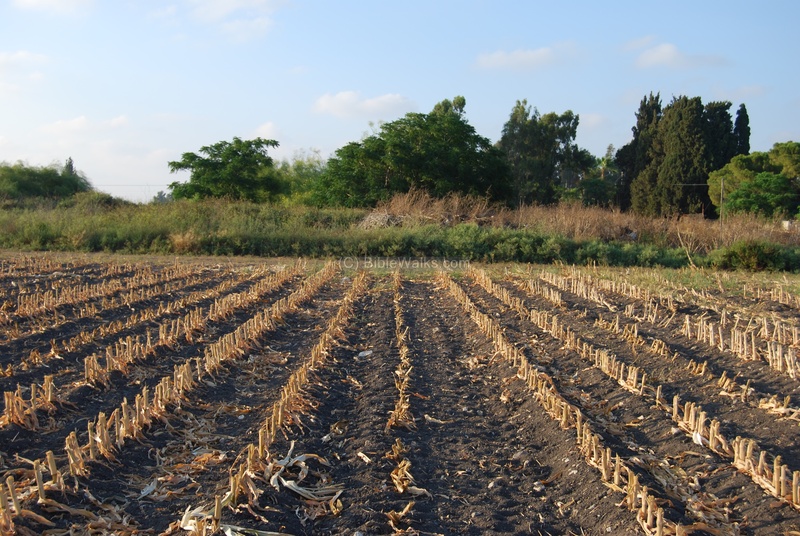 The swamps have been drained in the past century with canals that let the water flow to the Kishon river and out to the Mediterranean sea. In the 1940s several residential houses were built along its eastern side, a neighborhood called Rasco-Gimel. In recent years most of these houses were rebuilt and replaced by modern houses, and incorporated into Kefar-Bialik, an agriculture village that was established in 1934. 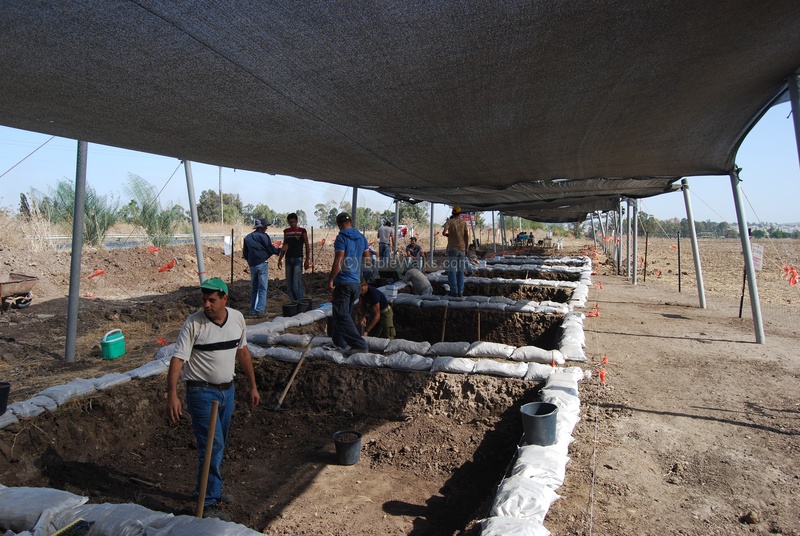 In 2007 excavations were conducted on the north- eastern side of the Tell, as part of the preparations for a new highway that is designed to pass on the east and south side of the Tell. A section of Via Maris may have been found in one of the trial square pits, and future work might unearth more sections of the ancient road. The photo below shows the Tell from the south-west side. The agriculture fields around it leveled most of the site, while the residential houses (one of them is seen on the right background) cut it away on the eastern side. On top of the Tell, near the trees, was a well, but it is covered today. The next picture is an aerial view of Tell Zavat, as seen from the west side. On top of the ancient site are several modern residential houses. In the left and right backgrounds are sections of the new Kerioth-Bypass (”Kvish Okef Kerioth”) highway. Behind the site, in the far background, is Kyriat Ata, and farther - the hills of lower Galilee. 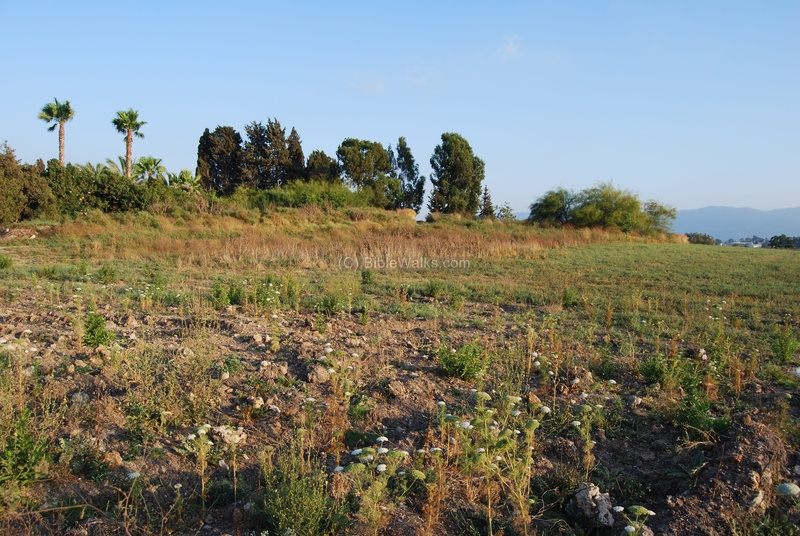 Although the mound is small, it is the tip of the iceberg: the actual ancient city was once standing dozens of meters around the center, but the intensive farming wiped out most of the remains. This photo was captured with a DJI Phantom 2 Vision flying camera ("Quadcopter") in February 2014. On the west side of the Tell is a modern dirt road, used by the farmers, which followed the path of the ancient road. The next ancient site along the path is located at the center of the trees in the far background. Behind the trees is the north side of Mount Carmel. The photo below is a view from the south side. The corn field is located on top of the edge of the site, and the soil contains numerous fragments of ceramics, stones, glass, basalt stones, and mosaic stones. A view from the south side towards mount Carmel is seen below. The city of Haifa is located on top of the Carmel on the right side, while on the left side are the high rises of Kiryat-Atta. A new highway (Kerioth-Bypass - ”Kvish Okef Kerioth”) is planned to pass at this point, following the same ancient route towards Haifa. Dig 2007: Was the ancient road found? A new highway, the Kerioth-Bypass (”Kvish Okef Kerioth”), is planned to bypass the Kerioth of Haifa, the northern residential neighborhoods in the bay of Haifa. The modern road is now in initial infrastructure works. It follows the path of the ancient highway, and it passes about 50M east to the Tell. Excavations were conducted in November 2007 on the eastern side of Tell Zavat in order to reveal and possibly salvage the ancient ruins along the path of the new highway. The archaeological work was headed by Amit Shedman of the Israeli Antiquities Authority. 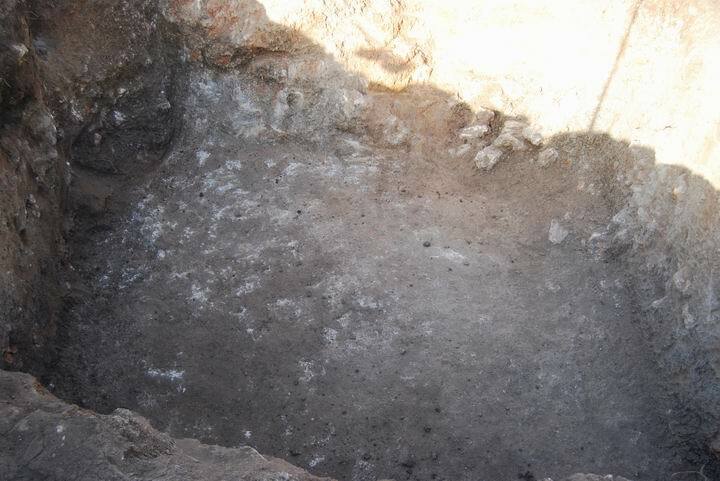 It started by cutting 8 trial square pits, as seen in the photo below, in a narrow section along the Ha'Amakim road and close to the junction. The depth was about 4M to the bedrock. 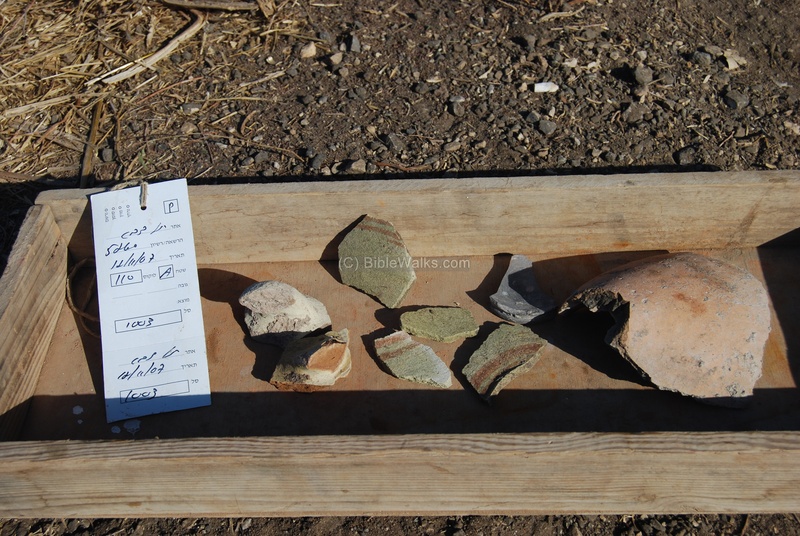 The photo below shows some of the pottery found in the pits, possibly dated to the Roman period. Some of the findings were found on the surface, as seen in the following bag - containing a flint-stone arrow head and a bronze coin. Most of the 8 pits did not yield much results. 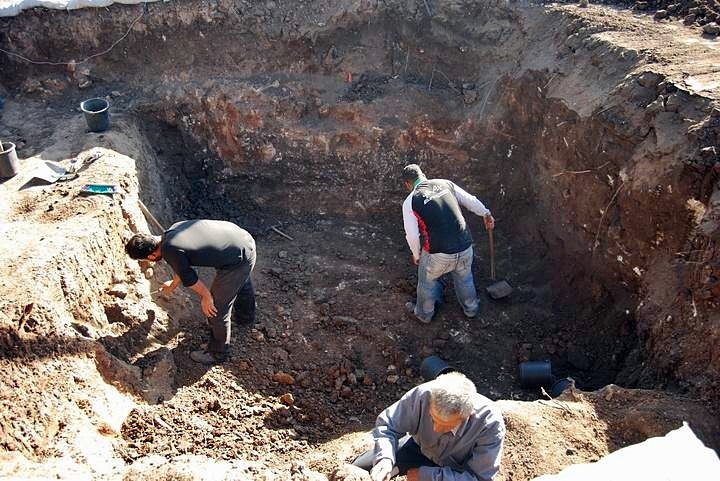 However, the eastern one, closest to the Tell, did reveal an interesting finding, making the archaeologists really excited: maybe they have stumbled upon the discovery of the ancient road. This is what was surfaced after cleaning the soil: a deep cavity in the sandstone bedrock, at a width of about 3M and depth of 2M into the rock. This may be, perhaps, a section of the ancient road that passed at this point and was cut into the rock. It passed in the north-south direction, and may have been part of the coastal section of Via Maris, as shown in the map above. A 3rd/4th C Roman coin has been found in the pit. The coin cannot be used to date this section since it may have fallen into it. The observe side is on the right, with the bust of the Caesar. The reverse side is seen on the left photo, with a Roman soldier pulling an arrow out of the pouch; the letters around the figure are in Greek. The current work permit limits the work to this narrow section. However, the archaeologists are waiting to dig up more sections of the road, maybe during the construction of the new highway. As it happens many times in Israel, modern constructions brings back to life old constructions. 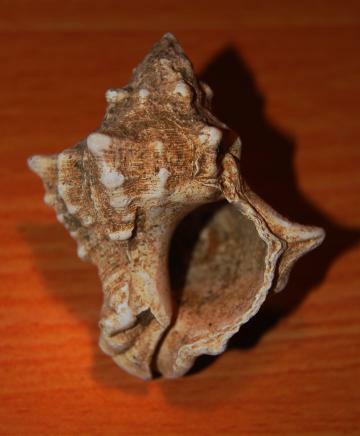 This medium-sized marine snail (Hilazon in Hebrew, Murex trunculus as scientific name) was one of the important sources of dye colors in antiquity. The Canaanites, Hebrews of the Zebulun tribe, and especially the Phoenicians produced the deep-purple indigo dye which was used for the textile industry. The Old testament specifies a blue dye (Tekhelet) for use in the Priestly garments as well in the layman's tzizit (fringes). For example (Exodus 28:6): "And they shall make the ephod of gold, of blue, and of purple, of scarlet, and fine twined linen, with cunning work". Since 60,000 murex were needed to produce one pound of dye, the dye was highly prized in ancient times. Their shells are found in most of the Phoenician sites along the coast in Israel and Lebanon. Dozens of these shells can be found in the fields around Tell Zavat. 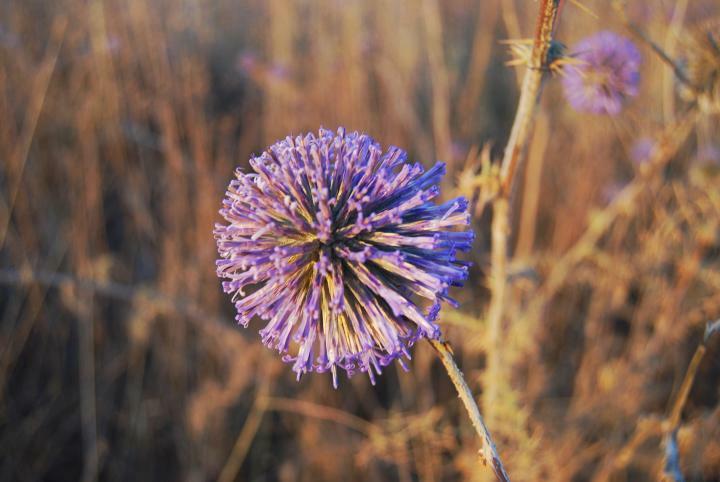 The common Kipodan (common Globe-thistle, or: Echinops adenocaulos) is a thorn that flowers in June -July, and is widespread in many areas of Israel. Another wild flower, found in the fields around the site, is common in agriculture farms - barns, cowsheds and poultry enclosures. 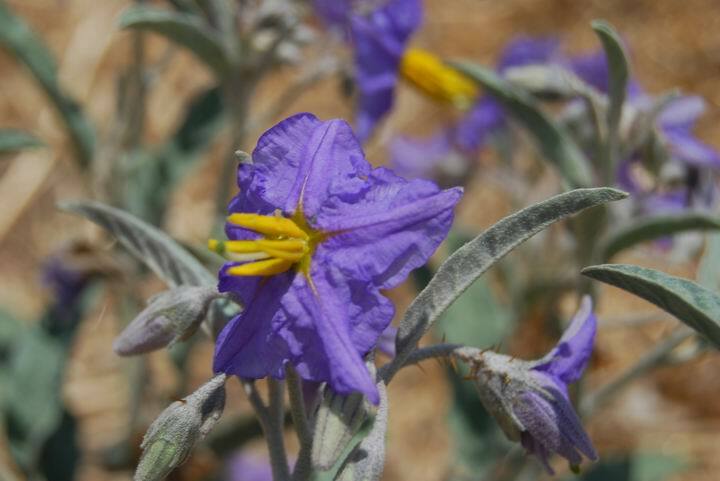 This flower is called Solenum (Silverleaf Nightshade, or: Solanum elaeagnifolium), which flowers between May-August. Its fruits are eaten by bats and birds, who spread it through their droppings. Warning: the fruits and other parts of this plant are poisonous if eaten by humans, and may even cause death! 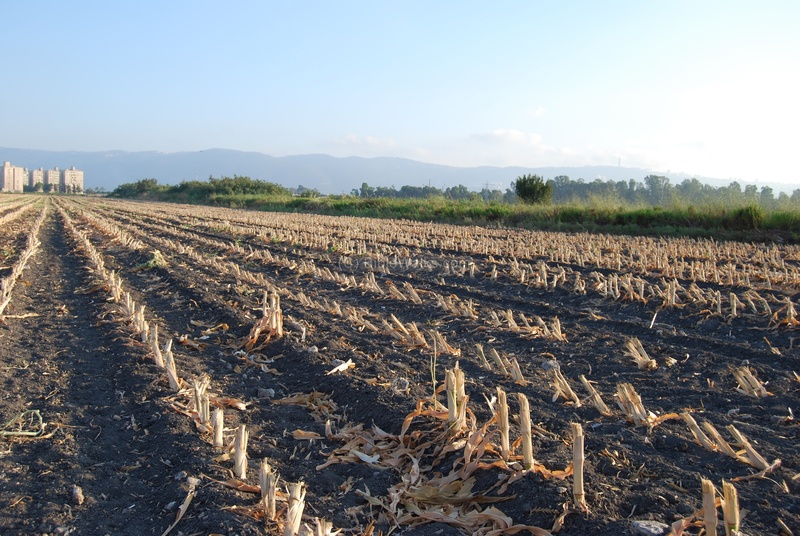 During winter, the heavy soil around the site gets swampy. A field of daffodils (Narcissus) blossoms between the green fields. A closer view of the flower. Its rich, heavily fragrance, coupled with its beauty- is divine. Wild white mustard flowers cover the sides of the roads. 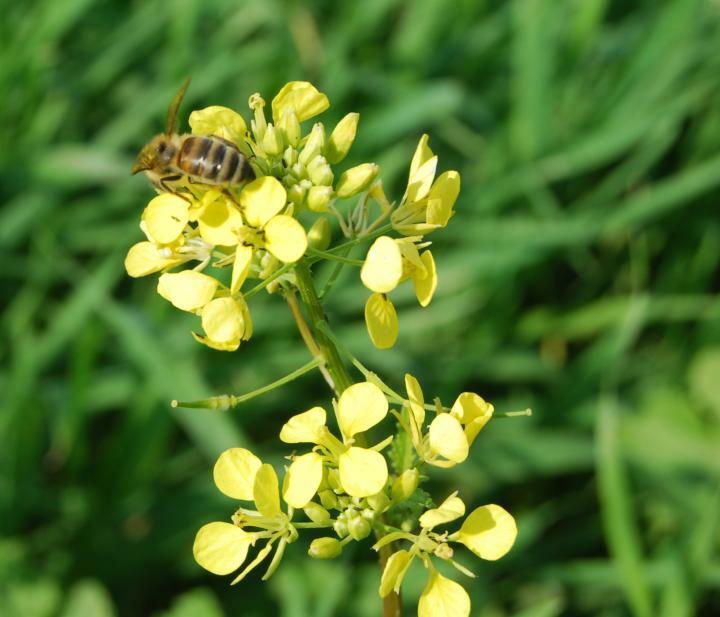 The photo below shows a bee sucking nectar from the flower. Subat - in Arabic: sleeping. Therefore the Tell may be translated as the "sleeping Tell". Tell es Subat - the name in PEF survey maps (1881-1883). It shows a road crossing east-west on its south side, with winter marsh areas on its western sides. A creek (el Fuwara) and a bridge is located 400M to its west side. Zavat - the Hebrew name of the Tell, based on the Arabic name (the closest name that sounds the same). Means in Hebrew: pinched. Derech Hayam - Hebrew - “the way of the sea”. In Latin; Via Maris. Biblical reference (Isaiah 9,1): “Nevertheless the dimness shall not be such as was in her vexation, when at the first he lightly afflicted the land of Zebulun and the land of Naphtali, and afterward did more grievously afflict her by the way of the sea, beyond Jordan, in Galilee of the nations”.